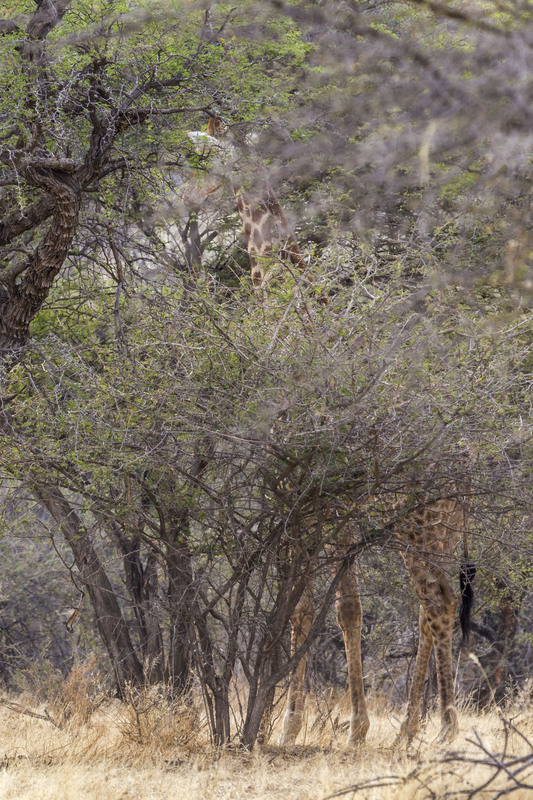 This image shows how well a giraffe can be hidden, even in relatively sparse vegetation. I cropped this shot so that the legs became readily identifiable. You’re going to have to trust me that from a distance, those same legs look just like slender tree trunks. Note that they’re a similar thickness to the trees the giraffe is standing next to. The branches in front of the giraffe’s neck are blurry in this telephoto shot, but ironically the giraffe is even better hidden in “real life.” You’d think that their bold spot pattern would stand out much more than it does, but it truly acts more to conceal than to reveal. If the giraffes’ camouflage has a design flaw, it would have to be the tail. That scraggly tuft of bold, black hair at the end doesn’t blend in unless you’re quite a distance away. Sometimes the easiest way to spot a giraffe in brush is to look for the tail instead of the head!